But I have a question before I rush off with credit card in hand for a new section. is it true or false ???? Do love the comments from ex sperts (seems everybody use to be a Mossie sailor) that go around. Easiest way to get the facts is to contact Phillip that sells the masts for the association (he doesn't make money out of it by the way) he does it as a volunteer. There was 1 only batch of masts from the manafacturer which somehow had been extruded incorrectly with a undersized web in them, when Phillip became aware that they where not suitable for sloop rig Mossies without reinforcment he told buyers so (he is still using a reinforced one by the way), they are no longer being sold by the association. The current batch of masts available from the association has been correctly extruded and are suitable for all Mossies without reinforcement. 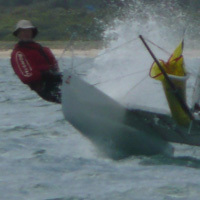 I have sailed Mossies for some 16 years now, sloop rigged, cat rigged and spinnaker rigged. Using about 6 masts, including one of the undersized web masts for cat and spinnaker for a few years (I still have it in one peice). The only mast I have ever broken was when another boat ran me over whilst capsized and the mast hit the bottom, any mast will break if put under pressure when it hits the bottom. Its ok to listen to EX Mossies sailors, but not all is true. As the quality of boats coming out now than back in the 70's has changed a hell of a lot. Is the mast section the EK4596 from Capral? Errr ... scratch that, Capral have confirmed that the die has been scrapped! Yes thats correct. Mast you van get from goodalls now! New masts with thicker area in the front and sides (same external section) from the Mossie Associations are only available to Mosquito Association members. If you are not a member of a Mosquito Association you can purchase from Goodalls. Actually that is not the case. The association is happy to supply mast sections to anyone that needs one, provided there is enough in stock. They have commonly been used for other 16ft cats like Cobras and Hydras, and for small Trailables. [/quote] New masts with thicker area in the front and sides (same external section) from the Mossie Associations are only available to Mosquito Association members. My Bad, what is written above is totaly wrong (note to self, don't rely on memory, too old ). As Tim said New masts are available from VMCA to everyone. Apologies to anyone I have mislead. How much are the association masts? Where can they be picked up from? Contact details are on the VMCA website here.